(Phys.org) —Although peacocks are famous for tall tail feathers with colorful eyespots, an expert says peahens look lower when sizing up a male and that dance moves may give a suitor an edge. Jessica Yorzinski, a researcher at Purdue University, is using eye-tracking technology and tiny cameras mounted on a customized cap to get a bird's-eye view and discover what attracts the most attention. "Surprisingly, the peahens are looking at the lowest edge of tail feathers and aren't paying much attention to the rest of the five-foot tall displays," said Yorzinski, who is a postdoctoral fellow in the Department of Biological Sciences. "According to our study, the females' gaze rarely fell at or above the peacocks' heads. Of the small portion of time spent looking at the males, females looked longest at the legs and lower portion of the train." The peacocks have a tough time keeping a peahen's attention as she evaluates her surroundings for food and predators, but the peacocks did have one way to turn heads, Yorzinski said. 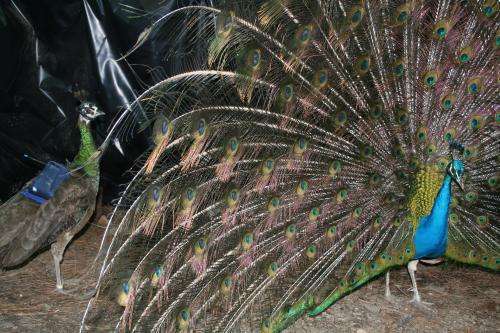 "What garnered the most attention from the peahens was when the peacocks would turn around and shake their wings and rattle their tails during the courtship dance," she said. "It seems that mastering certain dance moves is important for peacocks." Yorzinski's study of 12 peahens followed their gaze in the presence of multiple males vying for attention during the mating season. It did not evaluate which males won a mate. A paper detailing Yorzinski's study was published in the Journal of Experimental Biology. She is currently evaluating the results of an experiment that tracked what peacocks watch and attune to during courtship. 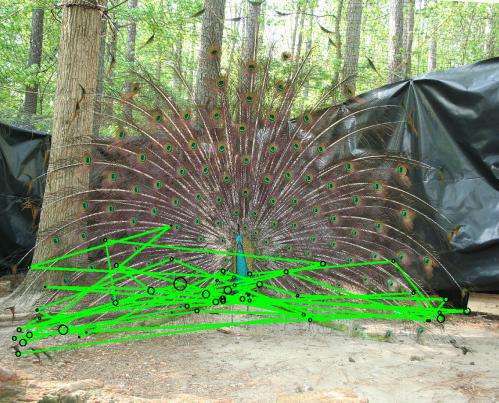 A better understanding of peafowl's visual perception could help in understanding avian behavior and lead to improvements in the protection of endangered species, she said.